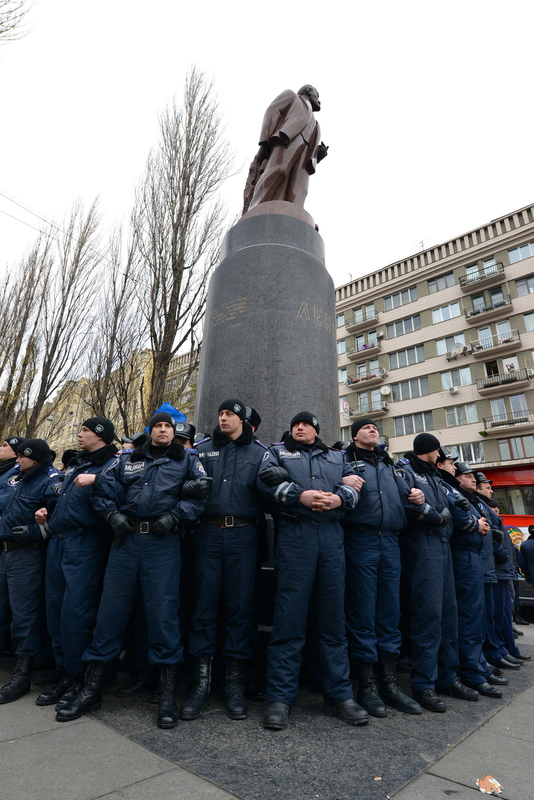 Lenin’s Lost his Head: What’s Going On in Kyiv? On Sunday, for the second time in two weeks, a half-million people gathered to protest against the government in Kyiv’s Maidan Nezalezhnosti (Independence Square) in an action dubbed on Twitter #ЕвроМайдан (EuroMaidan). Meanwhile, a short distance away, a smaller group of people toppled an eleven-foot statue of Vladimir Lenin, quickly removing its head and breaking the body up with a sledgehammer. 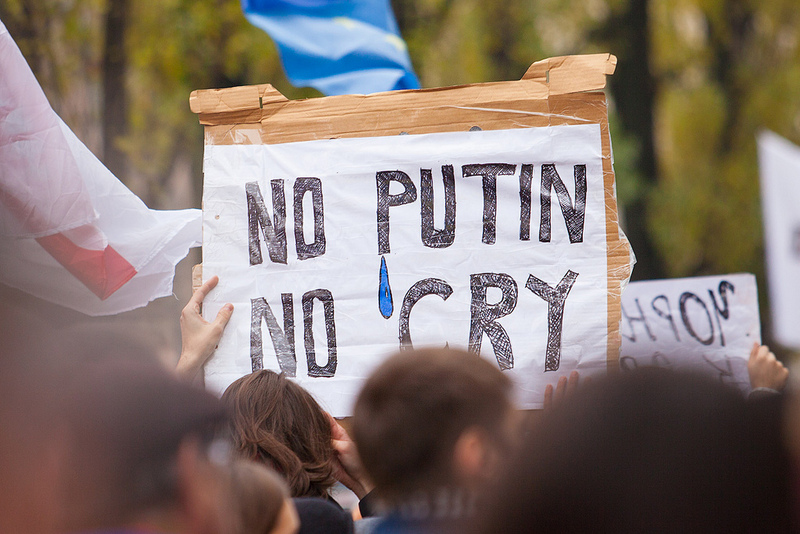 The images of the latest Ukrainian protests are reminiscent of the Orange Revolution. The Maidan is again the site of a makeshift opposition camp complete with field-kitchen, portable toilets, hundreds of tents, a stage, and barricades all decorated with Ukrainian flags. 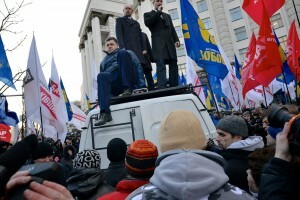 Viktor Yanukovich and Russia have also reprised their roles as the main villains and targets of popular protest. While there is value in comparing the Orange Revolution and EuroMaidan, there are also important differences that make the solution to the present situation much more complicated and uncertain. In reality, Ukraine remains far from being “at home” in Europe and the changes that would move the country in that direction would be difficult for both the incumbent government as well as opposition forces. 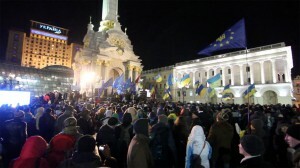 Ukraine is one of the most corrupt countries, not just in Europe, but also in the world. Transparency International ranks the country 144 out of 175, on par with Nigeria, Cameron and the Central African Republic, and well behind East Timor, the Ivory Coast and Russia according to the 2013 Corruption Perception Index. Much of that corruption is in the country’s “loss-making” energy sector, which has been hijacked, according to energy experts, by rent-seekers (rents are unearned income made by exploiting rules or institutions). Corruption within the energy sector has wide-reaching implications for Ukraine’s economic development. One of the main problems is energy insecurity (government subsidies suppress domestic energy production and encourage dependence on Russian imports) and the inability of the Ukrainian economy to adapt to global conditions (Ukraine has one of the world’s most energy inefficient economies, which makes domestic industry less competitive). The IMF and the EU have demanded reforms that would make the industry more transparent but the entrenched connections between the government (and opposition politicians like Yulia Tymoshenko who made her fortune in the energy sector) and energy industry make that unlikely. Moreover, changing a system that currently provides Ukrainian households with the cheapest gas and heating in Europe would likely be highly unpopular. This is especially so now, as the country’s economy slips into protracted stagnation and undergoes a third contraction since the 2008 economic crisis. These economic realities are largely unaddressed by the government as well as opposition demands. A major difference between the Orange Revolution and EuroMaidan is the make up and relative power of the opposition. The forces of the Orange Revolution, though they crumbled amidst infighting after the election, were united in their support of a single opposition presidential candidate: Viktor Yushchenko. In contrast, presently, there are three loosely affiliated leaders of the opposition. The first is a former economic minster, Arseniy Yatsenyuk, from Yulia Tymoshenko’s Fatherland party. He has government experience, but several news sources inside and outside Ukraine describe him as “uncharismatic.” The second is the leader of UDAR, Vitali Klitschko, who is the reigning World Boxing Council heavyweight champion. Klitschko is widely recognized in Ukraine but he is a relative newcomer to politics, having run unsuccessfully twice for the post of Kyiv mayor and only entered the Ukrainian Rada in December of 2012. The last opposition leader is Oleh Tyahnybok of the right-wing nationalist party Svoboda. Tyahnybok has been involved in Ukrainian politics since the early 1990s and is famous for anti-Semitic and anti-Russian rhetoric. What unites the opposition, according to the leaders, is the goal of “European integration,” which they think will be achieved once a snap election is called and Yanukovich is voted out of office. 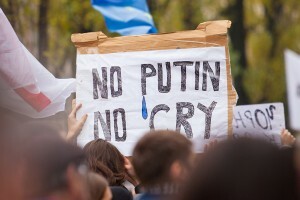 But removing the government has proven easier said than done, as the opposition learned last week, when they fell 40 votes short of pushing a no confidence motion through at the Verkhovna Rada that would have forced the resignation of the Prime Minister. Perhaps more worryingly, now that the opposition leaders have taken their fight from the legislator to the streets, is that the street protests do not seem to be wholly under their control. 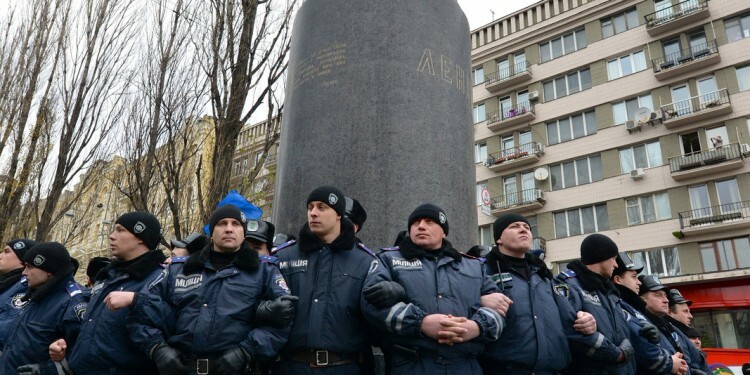 Though the opposition leadership has denounced the use violence, last weekend a well-armed group of young men, identified as members of an extreme right-wing party, attacked a police barricade. The presence of these right-wing elements within the anti-government protests could easily and quickly destabilize the situation in the streets leaving the opposition without any leverage in negotiating with the government. 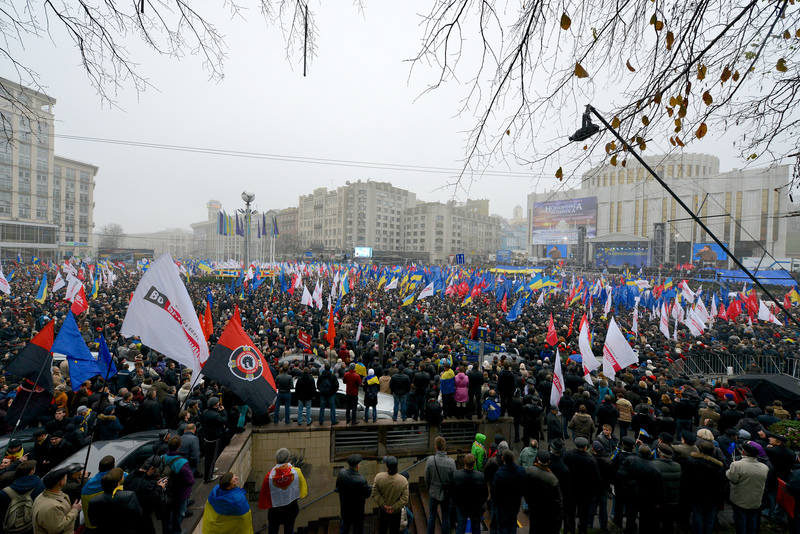 Experts differ on whether Ukraine needs Europe or whether Europe needs Ukraine. In the end, European integration may not even lie at the heart of why hundreds of thousands of people have come out to and stayed on the streets in Kyiv. Perhaps the most important similarity between the Orange Revolution and EuroMaidan is that now, as in 2004, Ukrainian citizens are deeply disappointed by their government’s continued disregard of the people’s wishes. A man quoted in independent Russia media stated his reasons for being on Maidan plainly: “I cannot sit at home, while the government rudely spits in our face.”That attitude is likely to sustain protesters during the coming weeks even if authorities ramp up their response and a political solution remains out of reach. 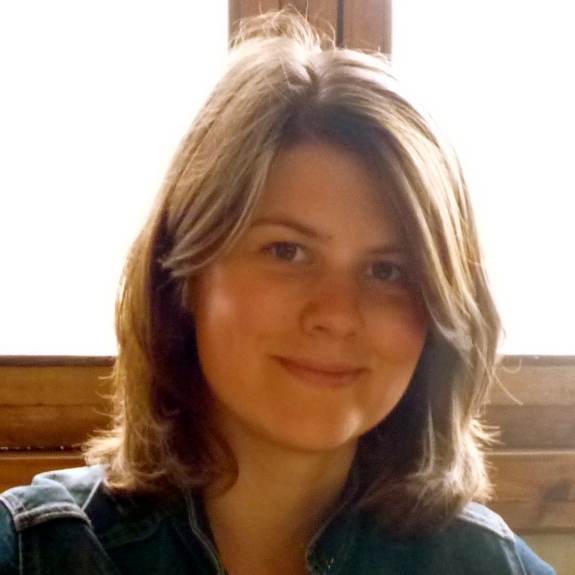 Postdoctoral Research Scholar in Russian Politics at Columbia University.